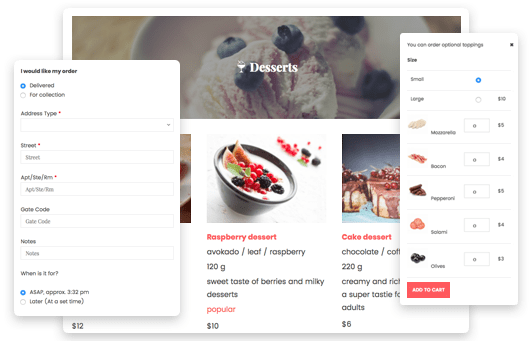 A user-friendly WordPress plugin to build your restaurant or cafe website and sell food and beverages online. Stunning tasty designs, ultimate item description with nutrition info, Food Delivery and Toppings extensions for extra functionality. Thanks to the WordPress Restaurant Menu plugin add-ons you are able to offer extremely beneficial and suitable options and make customer experience really valuable. Moreover, it’s easy to raise clients’ loyalty and improve retention due to the simplicity and convenience of these additional tools. Take your sales to the next level allowing the visitors to make a purchase online via a secure and popular payment system. Placing an order, your customers will be able to choose a payment method: PayPal or Cash on delivery. Both registered and unregistered users can make a purchase. The system also provides your buyers with the order statuses (processing, shipping and shipped) and confirmation/notification emails. It’s highly important for your online menu to look awesome on each device of everyone on the go. The Restaurant menu plugin guarantees optimal viewing on all mobile devices including small ones. The images of the menu items and categories look sharp and the texts are fully readable without scrolling. Construct categorically-organized lists of food and drinks (e.g. breakfast, lunch, dinner; drinks menu, desserts menu; breakfast on the go, casual meals, holiday menu, etc.) for easy search and navigation through the menu. Admin tools allow customizing each category by adding an appropriate image, title, description and icon (standard or custom). You are also free to create a child category for each parent one if there are a lot of menu items. It’s absolutely up to your taste how the online menu should be presented. We made sure the plugin works perfectly for any design. Grid or list layout can be applied to menu items and categories allowing you to find the best way to display your menu depending on the number of items or categories, website design and width. Several settings in shortcode parameters will do all this magic for you to display a beautiful and simple restaurant menu. All the necessary tweaks of moving your site to a new host or simple backup won’t affect the data created with a help of the WordPress Restaurant menu plugin in any way. You can safely export and import all the menu items and categories to further use on other websites and continue making your updates. It’s quite a simple process and involves a couple of clicks within your WordPress admin panel. The photos of your dishes are a true reality each customer is looking for. Spice up the online presence of your restaurant or cafe with attractive images to conquer each visitor at a first glance. The functionality of the plugin allows you setting a featured image for any menu item, menu category, and to supply each menu item with an individual image gallery. A picture is always worth a thousand words, show how tasty your items are with unlimited number of images and await for a lot of fans! Add a carefully organized menu as a sidebar widget and let it always be at hand of any website visitor. You can choose whether to display the entire menu or just some particular hot offerings. It will look perfect on desktops and will be automatically adjusted for proper mobile viewing. A great way to keep your sidebar useful and clutter-free at the same time. Can you name any better alternative for editing the website than WYSIWYG solution? Thanks to the full integration of the WordPress Restaurant Menu plugin with the MotoPress WordPress Page Builder you are free to play around with each setting online and choose the best way to show your menu much faster and easier than through default shortcode added in the TinyMCE. Setting up the menu via the Content Editor you’ll see all the menu elements directly in the site area and will edit the appearance of the menu visually. Works perfectly with MotoPress WordPress Slider. If you noticed any bug or have a scarcely useful proposition on how to improve the plugin, let your voice be heard! MotoPress support representatives are always ready to answer your questions and discuss ideas in a timely manner. Professional tech guys are always keep looking for better options and are eager to put into use everything they learn from the users. Hello, It looks like a great plugin. If I need it on multilingual website is it possible to have menus translated with WPML or Polylang? Is it a strait forward process or needs something additional? Thanks. I’m thinking of this plugin for a project but we are already using the stripe.com payment processor. Do you have support that? Unfortunately, only PayPal and Cash on Delivery are in-built into the plugin. However, we have Sample Gateway addon to make it possible to integrate the payment methods you need. Hello. . .I really like the plugin but I have some questions. That I cannot seem to find answers for. Can it accept credit cards? How is the restaurant notified of orders placed? You cannot request credit card info directly as it is not safe. You can use the PayPal payment gateway for it. This gateway can be set up so that the customers could pay by credit card without registering a PayPal account. The notifications of new orders are sent to the email that you state in the settings. Most likely you mean cover image of category. You can remove by going to Restaurant Menu > Categories and select one to edit. Try to apply other Thumbnail image or remove it at all. Contact our support team in case you need our assistance. no it’s not the cover image, it’s above the cover image. The last menu item I create in each menu category is showing at the top. if you click the link it might give you a better understanding of what I’m taking about. Also is there a way to add a checkbox for if it’s an estimate for a catering event. By the link that you provided there is nothing above the cover image. Please, contact our support team providing screenshots of the problem. Its good, but I have a question about the demo. You have Beverages section with Juice, coffee etc. as my choices. Am I able then to add a selection of juices under the Juice choice like, Apple, Pineapple, Orange etc. that will have their own page when selected? 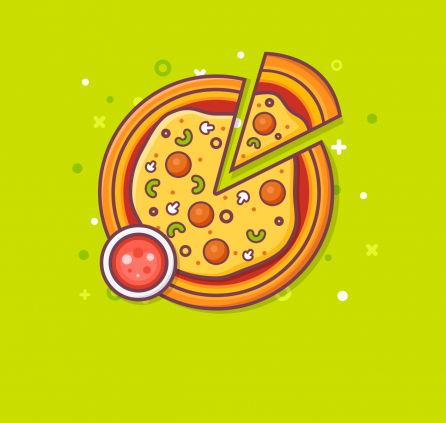 Yes, you can create and display as many categories and sub-categories as needed, but if you want to display different menu item variations available for online order then it would be easier to set up with the Toppings addon as it has the needed functionality. Hi I have online food ordering site. I am interested to used your plugin, but I need to make sure could I used discount option like 10% or 15% on total value and also discount code. A big shout out for your plugin. This is really awesome! I have a quick question if that is ok.. How to change the currency icon..the default shows the dollar sign, I would like to have it in CHF (or Franc). Thank you for kind words. You can change the currency under Restaurant Menu>Settings>General>Currency Settings. Hi Bruce, could you clarify your comment. Do you mean that you need various prices for this product? Timetable plugin is free and you are able to use it without any money. Let me know if you have any other questions. Thank you for clarification. Yes, sure you can apply different prices, sizes with Toppings addon. Looks great. Will you guys have Stripe integration anytime soon? We have added Sample Gateway addon to make it possible to integrate the payment methods you need. It depends on what exactly you want to change there. Actually you can follow our guide on how to override templates of restaurant menu at our Documentation. You may ask additional questions at our forum if you need more details. Remove the entire section..or leave only price product. You can upload this file to root folder of your theme (/wp-content/themes/your_theme_folder) I’ve removed sidebar at all. If it is not helpful you please create topic at forum or submit a request to our support team. We’d like to take a closer look at your WordPress installation. Could you email us? Hi, I like it! I’m interested. Is plugin standalone? Can i set coupons? There is no option for discounts or coupon codes currently. Could you specify what you mean under ‘standalone’ exactly? Can i use restaurant plugin with my builder ? Thank you for explanation. This plugin can be used at WordPress CMS only. Walter, i am also a web developer I think I might be able to help. If you create an addon solution with discount codes for our Restaurant Menu you are pleased to sell it at our website with 30% commission. I emailed you guys and haven’t heard back. How long do email responses usually take? We are sorry for a delay. The reply time depends on the volume of current inquiries and a kind of your issue. Please wait for our reply. hi, i would like to create a simple list menu but i don’t know how to do it … can u help me please? Is there any Api option for gateways that we can use to connect to our gateway. First Data is who we use. Also does the list view have the option to order. I didn’t see a way to add to cart. We’ll prepare it for you. Could you submit a request so that we could email it to you when it is done. As for ‘Simple List’ view so payment option was no intended by design. You can try to use ‘List’ view hiding images if you do not need them. There is available ‘Add to Cart’ button. We have added Sample Gateway Addon that can be used as example for adding custom gateway for Restaurant Menu plugin. Hi! the plugin is just an awesome… I would like to ask whether it supports for flat rate shipping for delivery to the customer by including the nominal fee for the shipping. Hi Yash, you can control shipping fee with Delivery Addon. Unfortunately we can not solve technical questions here. You can submit a request providing admin login data. Our support team will have a closer look at it. Good, a favor, as I add a field date and another time, I need my clients to select, the day and time for delivery of an order? Good morning, I congratulate you first on the plugin restaurant-menu-plugin, but I have a problem is when you select a product and click to add to the cart, and then see the shopping cart in the selected product there is an option: Already have an account? Login, clicking on a form opens to dijitar user name and password, in that form is not allowed to write anything. Because this happens, thank you. We could not replicate the issue you described on our side. We need to have a closer look at your WordPress installation. Please submit a request provide access to your WordPress. I want to set up special menus for certain events that include only some of the menu items and possibly at different prices. Is there a way to do that? Is there a way to set up two separate Restaurant menus on one site? Yes, you can add unlimited amount of categories. Then add menu with certain categories or even IDs of menu items. Hi, i really love your plugin! Just one thing, how can i display a cart link with the cart status? I’ve added your suggestion to feature request list. Probably it will be available in one of further versions. I’m wanting to use this with Divi.. but it doesn’t realy seem to be formatting correctly. No matter what I change on the shortcode, it just keepds showing all of my menu items. You can submit a request to our support team. We’ll have a closer look at it. Hi. great plugin, really nice design. the only thing is meal sizes. will I be able to put portion sizes to let’s say pizza’s. like small-medium-lard ? so clients can choose which size they are going to order? No, there is no option currently. You can create three different products for now. We’ll keep in mind your request. Thank you for your idea. It was resolved, in the settings page the I had to change the Template Mode to the Developer mode in the dropdown. Write us at [email protected] with your issue details. Hi first of all great plugin. I was wondering if we could ad delivery option into this plugin? Thanks..
We are working on a delivery add-on. There will be delivery or pick-up options, price and time of delivery. If you have something to add, we would like to think about implementing your ideas. When will you have that option ready? is there any advice what can i use in the mean time? We need 3-4 weeks. Right now you have a “Shipping address” filed on the checkout page. What options do you need? This plugin works with Woocommerce? WooCommerce is not integrated into Restaurant Menu plugin currently but there is payment option available. The are 3 payment gateway available: PayPal Standard, Test Payment (auto-complete orders), Cash on delivery (process orders manually). Have a nice day. Restaurant menu plugin is independent solution for listing and selling menu items online. It is not integrated with WooCommerce. Sell extra food ingredients and drinks along with menu items. Let users sign up for your MailChimp lists and groups via subscription form. WordPress Page Builder to create pages & posts visually.